The British Educational Training and Technology Show, or BETT as it’s more commonly known, is a major educational event that happens every January at ExCeL London. With a footfall of 35,000 across four days, there are a multitude of activities happening at differing locations throughout. So how did ThinkWall help keep people engaged and inform them of where and when things were happening? This year, we had 15 screens around the venue taking advantage of our Social Signage, Digital Signage and a custom plugin for displaying agendas. All of these were managed from a central location, thanks to the cloud nature of our software, coping with the typical event venue issues like poor Internet connections. As with all of our ThinkWalls, we did a branded design to suit their guidelines. 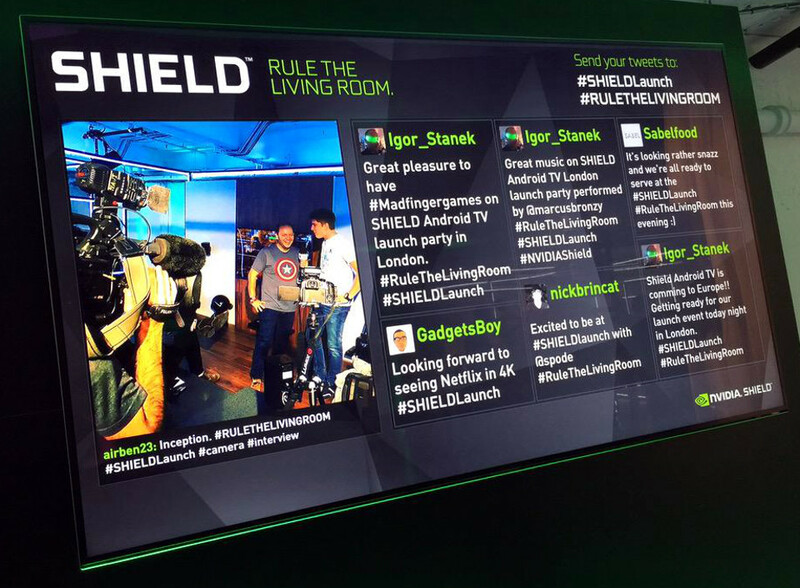 The right hand side of the side of the screen alternates between a gallery of photos and tweets that were happening on the very busy hashtag (around 10,000 a day from Twitter and Instagram). At first, we used our “light touch” approach with a series of filters, but with such a busy hashtag it didn’t take long before it was being hijacked by ne’er-do-wells. At this point we switched to moderating each piece of content before it went on screen. Time consuming, but had the added benefit of curating the content too, removing not just inappropriate, but also boring messages. People love seeing their content on the big screen, but visitors also got first hand opinions of what was hot and where to go. Crowd journalism at its best. On the left hand side, we showed what was happening now, and what was coming up next. Most of the time, this was for the area the screen was outside, but in other areas (such as the press office) this included multiple agendas at once so they could see what options were available to them. Rather than using our control panel to input data, we used a Google Spreadsheet which was then imported automatically into the control panel. This was the easiest way to collaborate with the team with such a large data set, without needing any training. Any changes that came in, we were instantly notified. The changes were sanity checked before being pushed out to the screens. Silently, they updated with the new data without anyone noticing. On various days, site wide notices were required - such as an advert promoting free drinks being available after the event. The full screen advert was uploaded and quickly deployed without any of the screens needing to be touched. With 35,000 people excluding exhibitors, reliable Internet was a tall order. Many walls were cabled in, but for some this wasn’t an option. We design and test ThinkWall on connection speeds as low as a 56k modem, with frequent disconnects. This wasn’t far off what we ended up with on site - but the data trickled through and you never saw a half loaded image or an error message. How do you create a likeable brand? Creating a likeable brand begins with the corporate culture, which has roots in the founders and directors personality and character. People like a brand because it resonates with them. As the old saying goes ‘people buy from people' and it is still the case in our digital age. So, always be honest and never exaggerate. A business is more profitable if people trust the people behind the logos and advertising slogans. Follow the principles of TART framework to build a likeable brand and listen to the conversations about #meaningfulbrands. How can the power of data, audience psychology and creativity drive results? It doesn’t take a genius to realise that it’s impossible to make good decisions without data and understanding of audience behaviour and customer psychology. Making business decisions without data is scary. Data helps finding patterns and anticipating change, which fuel creativity and innovation. Creativity and data go hand in hand; they are inseparable. Creativity allows you to excite your customers; and you won’t be able to do that unless you interact with them. What’s the difference between digital and social media marketing? First of all, as soon as you stick the term ‘marketing’ to anything you put people off, unless you have something meaningful to share that people can relate to. It is all about responding to needs as opposed to creating one. Social media is a part of digital media and I don’t really understand why most businesses are insisting to treat the two separately. However, unlike some components of digital marketing that target the mass and reporting on big numbers, social media is more about niche targeting and meaningful conversations. Social media is more about conversations and communications and less (if at all) about marketing. Brands using digital marketing techniques know how difficult it is to drive quality traffic to their websites and convert interactions with their ads and banners to paying customers; it is even more difficult to do so on social media channels. Simply because, people on social media are demanding open, meaningful and transparent conversations; they are not on social media to buy from sellers and “engage” with ads and promotions. Digital media requires more content consumption and interaction evaluation, whereas social media requires in-depth behaviour and psychological evaluation. In a nutshell, they’re complementary of each other and go hand in hand. Where is Social Media marketing heading? Social media is all about common sense and back to basics. It is a major part of almost everyone’s life in this day and age. Most businesses chose to experiment with different ways of selling and marketing their products and services on social media but, a few like KLM, GiffGaff and Innocent Drinks have invested in customer service and building community. The good news is, social media as we know it, is transforming; and more brands are trying to create conversation and engage with their customers on social media channels. They just realised, they don’t have to be on every social media channel only because their competitors are. Social media offers an opportunity to brands to build relationship and trust; the fundamental components of word of mouth in 21st century. Data driven and relevant storytelling with some personal touch by being creative, engaging, friendly and funny deem to be the future trends. Last Week was an exciting week for us. We did our first event with Google at their London HQ, and we also created our first 4K resolution ThinkWall, in conjunction with Nvidia for the launch of their new Shield TV device. When designing and creating ThinkWall, we always ask "what if?" and one of those early questions was, "what if people want non-standard resolutions?". So from the very beginning we designed it to work at any aspect ratio, orientation and resolution. We scale to fit any screen and can even compensate for common AV woes like overscan or incorrectly interpreted feeds. We also use some rather complex scaling algorithms to make our tweets as legible as possible, which in our minds is the ultimate goal. It doesn't matter how pretty it looks if people can't read it. Credit to @NicolasCatard for taking this lovely photo of ThinkWall in action. 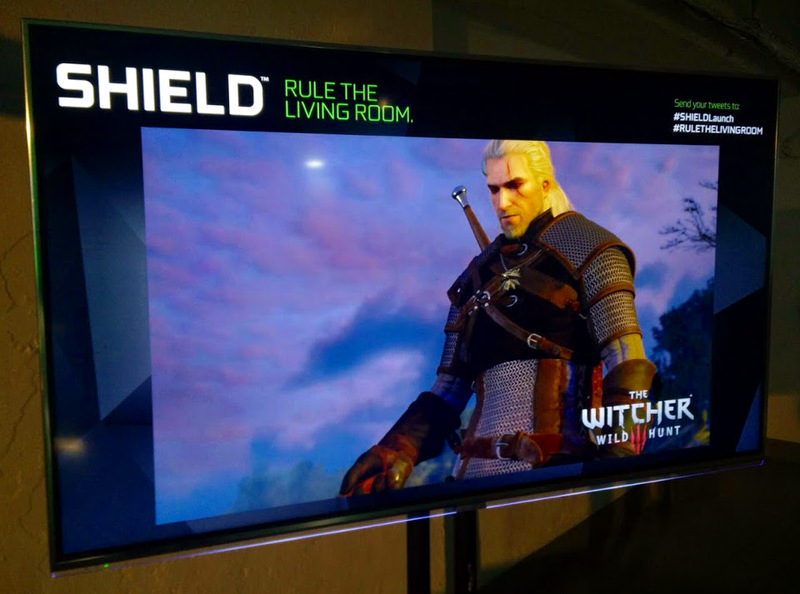 We've been waiting for an excuse to work on a 4K ThinkWall and thankfully Nvidia came to use with that requirement. They had a number of 65" 4K screens that not only needed tweets and photos, but also needed to display 4K video at intervals throughout the day, or on demand. Being a graphics company, Nvidia's standards in this area are very high and they certainly weren't disappointed. 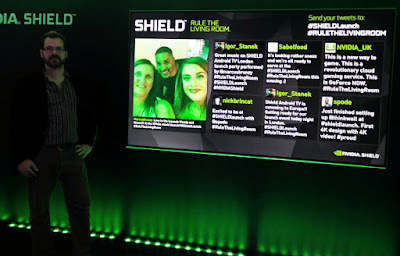 "Seeing a ThinkWall in 4K really is a thing of beauty - an easy way for your audience to share high resolution photos, videos, and of course live reaction to your event. Feedback has been consistently excellent and events now simply don't feel complete without one!" We showed their 4K promotional video every 15 minutes, inside a branded template. ThinkWall has excellent video support - caching everything beforehand so that you never see any buffering or stuttering. This also means we can work well on slow connections as it doesn't actively do any streaming - just an initial download. We obviously support full screen, but by using our design work in this way, you still get the benefit of a branded wall, with the #tag on display for later engagement. 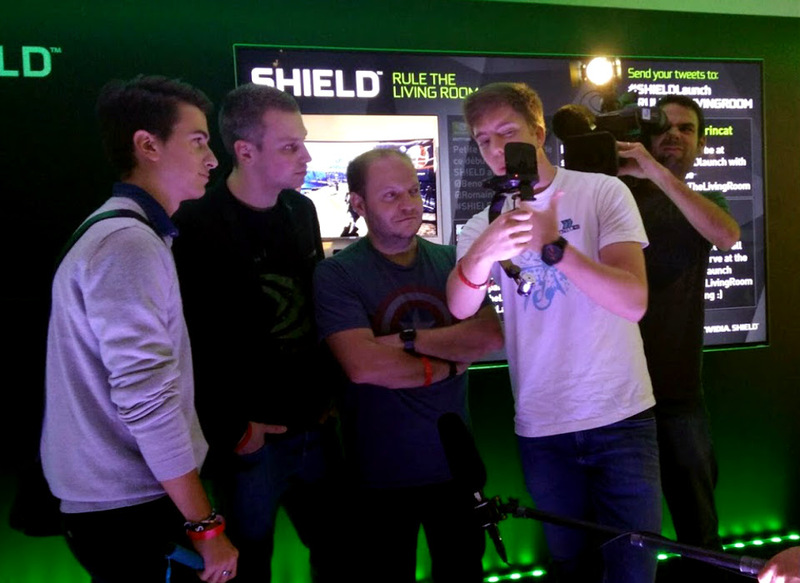 Here the @thinkwall was used a backdrop during filming. 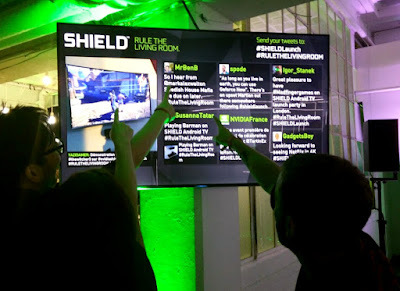 A common scene throughout the night - people pointing at tweets and photos of interest. All in all it was an amazing night and everything went off without a hitch! There is no single best way to sell tickets for your events. It all depends on the type of event you are running and the preferences of your audience. For example, some people prefer to buy tickets via their mobile whereas others prefer purchasing tickets through your website or social media dedicated app. Of course there are still people who prefer purchasing tickets in person from a ticket office at your venue on the day. Whatever channel you choose to sell your tickets on should be easy to use, both for you and your attendees. Some event organisers choose to have different prices on different channels for the same event in order to ensure maximum tickets sold. Although this tactic can be practical, it may cause disappointment for customers if they end up paying more because they are not on, for example, Facebook or they just prefer to buy their tickets at your venue. You can argue about the costs that may occur to you but consider the event experience you will create for your customers and prospects, which can have a positive impact on sales. People buying tickets before the event think about the value they will get. Therefore it is important to meet their expectations through assuring them by facts and evidence; one strong reason why they should attend your event. With the increasing popularity of social media amongst people and businesses alike, it is important to use social media to promote your events and engage with your attendees and partners. One effective way of doing that is capturing your attendees Twitter handle and Instagram ID during the sales process as well as displaying tweets and images about your event on screens around your venue. You can even share information about your next events and promote early bird tickets during an existing event. Pre-event activities help you raise awareness and generate interest which can increase sign ups and sales. During this phase, you as an event organiser can learn a lot about your prospects which will help you maximise impact during your event. Knowing your audience during your event helps you increase interaction. 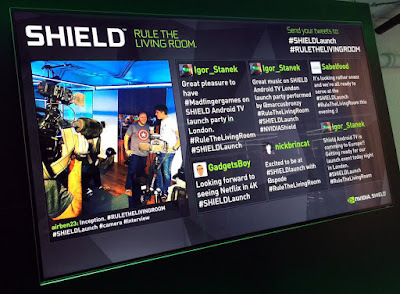 Having technology that enables you to moderate conversations and display relevant and appropriate tweets and images during your event is proved to improve brand engagement and word of mouth in favour of reputation for the event. Visualising social media content would give your attendees more reason and motivation to share their thoughts on social media. This not only helps you get more exposure for your existing event but also puts you at the forefront of people's minds for your future events. This is what is in it for you, but there is something in it for your attendees too, they can position themselves as thought leaders and influencers. At the post event stage you evaluate the ROI and the impact of your event. When you have established the impact your event had, you may decide to share your findings with bloggers and journalists who are likely to be interested in what you achieved. This third and final phase is as important as the previous two phases because you will show your attendees that you delivered on your promises and encourage further interaction with your content. This can lead to more inquiries and tickets sales when you launch your next event. At the end, you may not need to spend a lot of money on marketing and advertising to sell more tickets next time but, you will definitely need to spend more time and resources to create valuable and meaningful experiences. Lots of great new ideas came our way in 2014, and we have incorporated the best of these into our roadmap for ThinkWall product development through 2015. Over the winter break we put the first of these new features through testing, we're pleased to be able to officially announce everything is ready for use at your events. Why not arrange for a demo today, to see these new features in action and discuss your 2015 events. 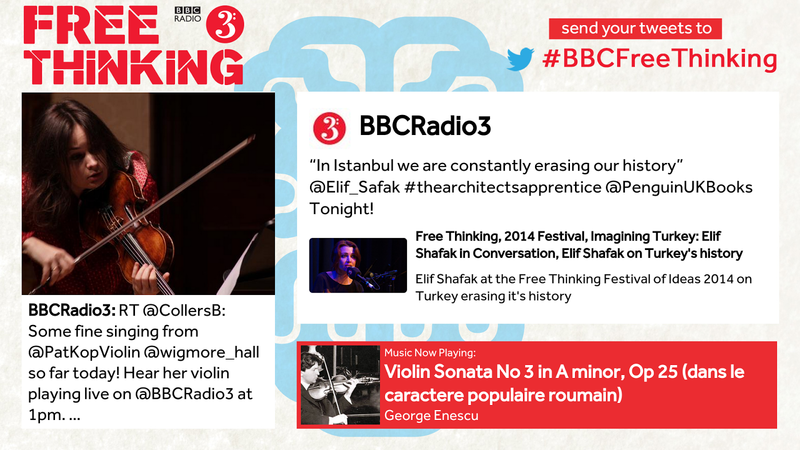 As part of the #BeerForThat campaign, we were given the challenge of rendering Twitter Cards. We’re delighted to say this is now available to everyone. 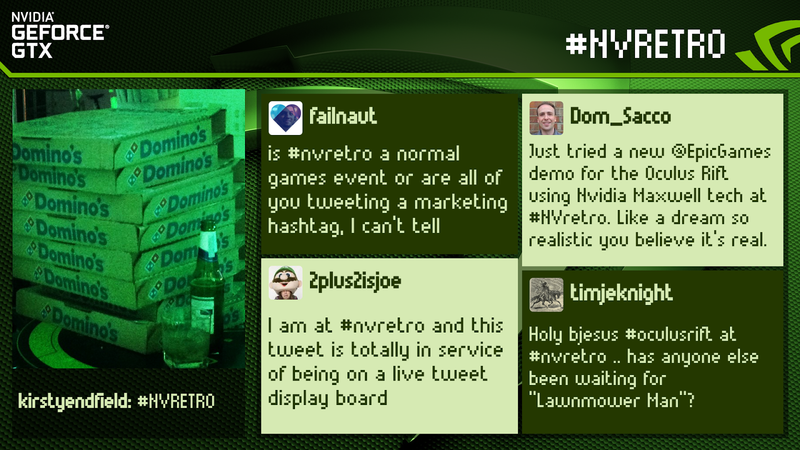 If you tweet a link that uses Twitter Cards we’ll include those in the display. Twitter Cards containing photos will be added into the normal photo slideshow, other card types are rendered directly below the tweet with image thumbnail and description. It’s useful to be able to configure the look and feel of walls from a desktop computer, before any walls at the event are setup. That’s now possible - you can set any wall configuration to be the “template” wall. This means that any future walls that are launched will take these settings, instead of the ThinkWall defaults. This, on top of our already flexible configuration system, empowers you to configure your walls quickly and easily. Several clients have requested a Pinterest style grid layout, and as always, we’ve listened. You can define the number of columns/rows you want in your grid and configure various other settings such as border, colours and spacing. Legibility is very important to us and always takes priority over gimmicks. Even in a grid layout, ThinkWall will scale your content to fit perfectly at the maximum font size available. We have ensured that text will never be too small to read. For those who prefer a neatly tiled grid, you can choose to lock each box at a fixed size. Some customers don’t like having an individual photos box, so we’ve also taken this opportunity to render photos as thumbnails, in the same way we render Twitter Cards. This means you’re able to have photos displayed inline with the rest of the tweets. Creating this system required quite a rewrite of our rendering engine, which of course has been tested thoroughly to our strict standards to maintain our robust platform. In the process we have made speed improvements for those stuck with older laptops, and added new animations for those who want to cause a little more distraction. These include an explosion effect, amongst several other more subtle animations. As a way of stopping people repeatedly spamming or flooding ThinkWall, we’ve always had the option of restricting the number of tweets per user. However, this can be annoying if you don’t want your own client/organiser’s tweets being restricted too. We’ve added in a separate setting just for your approved accounts, so you can put emphasis on your own social media content should you want. 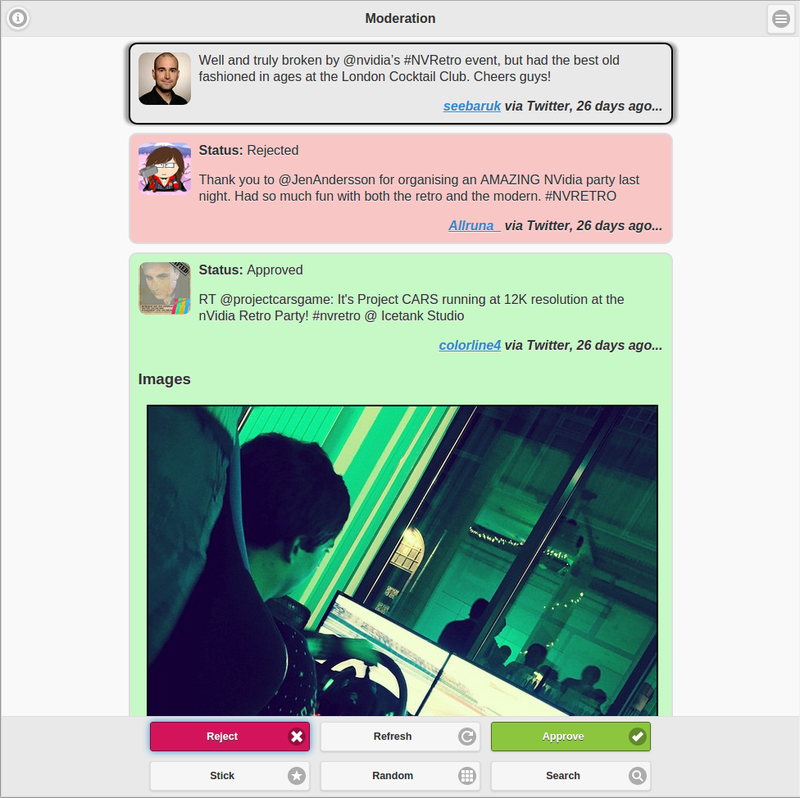 We’ve always tried to make moderation a simple task, now we’ve made this faster too. Content is now displayed in a list, rather than individually, making it easier to see an overview of what you’re working on. ThinkWall intelligently selects which tweet is in your focus, so there are no additional clicks required with this approach. We’ve increased the number of keyboard shortcuts available too, there’s a help button with a full list of these for your reference. You can now do everything without ever touching the mouse, making for super speedy moderation. Somewhat controversially, we have added the ability to edit message body text. We create the tool, so it’s up to you how you use it - but be careful on the possible impact this can have by editing people’s content that their name is attributed to. We would only recommend this for starring out profanity or correct spellings, without changing meaning. Interested in a demo? Email bookings@thinkwall.com today. Grosvenor Casinos invited us to give a speech at the Tech Startup Networking Event a few weeks back. Our director, Dan Monsieurle, gave a speech on behavioural science, hoping to inspire fellow entrepreneurs with some practical examples. Dan’s speech challenged the role of non-technical founders and sought to use behavioural science as a a way to understand why their marketing and sales campaign are so successful, or not. The main area that covered was cognitive dissonance as a way to inject conflicting communication that might sway the decisions faced by a potential customer. The speech was unfortunately not filmed. Don’t worry however, more detailed blogs about the talk will be posted later; going into greater depths about specific topics in behavioural science. Dan’s speaker notes can also be obtained from the slideshow, so an insight into his (slightly strange) mind is always available. Practical examples were featured where cognitive dissonance has been able to dispel myths from large marketing campaigns. The example given was the Dollar Shave Club, in this brilliant example Michael Dubin manages to turn a warehouse full of $1 razor blades into a company worth $10 Million! Michael noticed people were overpaying for a supposedly more “comfortable” shave when they didn't need to, and could instead save a lot of money. Coincidentally, Michael Dubin spoke at Financial Times’ September #FTMarketing event in New York. ThinkWall was there to boost audience social media engagement, and captured these 5 key points to consider when creating social content. Michael’s advice is clear and simple, definitely a useful process to follow. It’s easy to see how this has been used successfully at Dollar Shave Club.